Prince Rupert, 1958. It soon became obvious to me that I was going to be limited in learning more about locomotives. 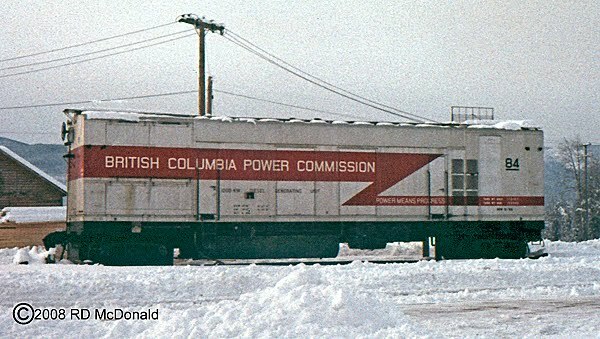 Routine power into Prince Rupert was GP-7's and 9's, cab units, and the hybrid SW1200RS's. Moreover, there was obviously a power pool of assigned units. 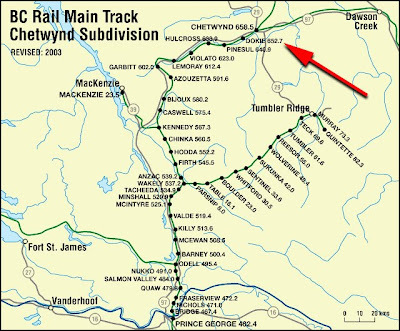 The same engines were coming and going between Prince Rupert and Division up at Smithers. 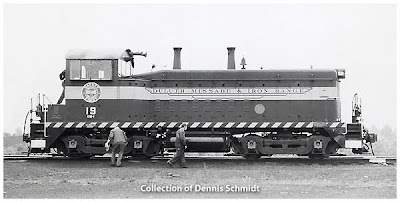 One way I came up with to learn about different locomotive types was through my mailing campaign, gathering information from the various locomotive builders. And I also had access to both "Trains" and "Railroad" magazines. I met several "pen pals" through these publications. We traded photos and negatives with each other. One scheme we tried was "the Revolving Picture Collection." The concept was simple and it sounded like a great way to build up one's photo collection, right? The "Revolving Picture Collection," mostly 5" x 3¼," was initiated by each of us sending twenty photographs to the fellow at the top of our alphabetized list of members. He assembled the packet in a box containing some 100 photographs and mailed it to the next guy on the list. The rule was, you had three days to pull photographs out of the packet, replacing with a like number, and move the package to the next guy on the list. Photos submitted were known as "traders." "Traders" is a term for "good" but not the "best" from your collection. But we soon discovered, one man's "Trader" was another man's junk. You just know where this is going … The final agonizing days of the "Revolving Picture Collection" were not pretty. And I am not so sure that to this day, lives are not still in danger! This photo I traded with a fellow down in Portland, Tim Kaufman. 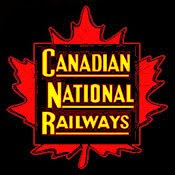 We later created another scheme, the National Association of Train Orders Collectors. 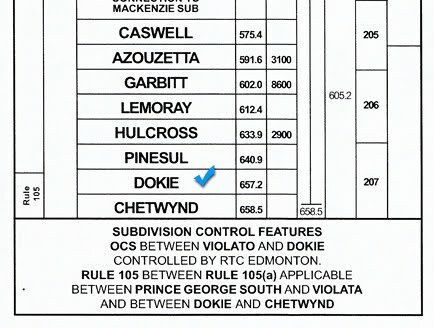 In NATOC, we put together a packet of Train Orders. Like the "Revolving Picture Collection" you took train orders out of the collection, and replaced them - you remember the routine. As I recall, this program lasted about the same length of time, one rotation through the group! To this day, I have a box full of train orders, mostly from the 50's and 60's, remnants of that ill fated plan. I always favored this photo. To some it is merely an SW 9 switch engine. It means much more to me. There is something "beefy" about this shot. Perhaps it's because the crew fussing around her look smaller than they really are, simply because she is elevated above them. What ever it is, I've been hauling this photo around for more than 50 years! I had a book written about the DM&IR, which was owned by US Steel. In one chapter, there was a narrative of a cab ride in a quartet of F9's, in full dynamics, trying not to be shoved into Lake Superior! In 1974, we drove from Portland to Duluth for a family reunion. We got to watch an ore carrier transit the Duluth Port Canal, and then on to see the railroad. We got directions to a "hot spot" to take photos of a DM&IR train passing by. We waited and waited. And waited. Now a sensible rail fan knows when the wife has "endured" enough. No sooner had we given up and left our photo opportunity when I heard a cacophony of air horns behind us. 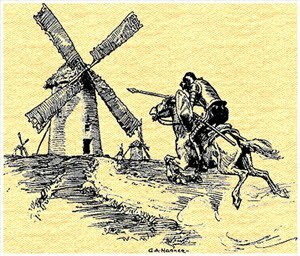 But I knew better, and grimly pressed on to the family reunion! 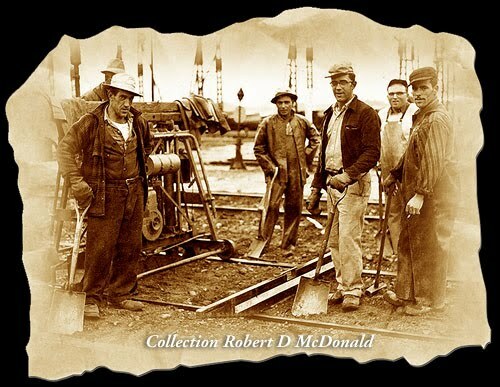 The back of this photo has the name "Dennis Schmidt, Elkhart, Ind. DM&IR 19, Duluth, Minn. 7/4/58." 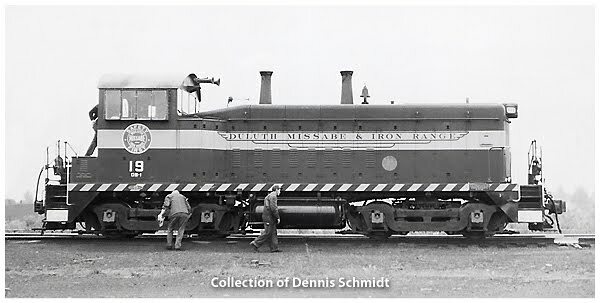 Railroad Stuff: DM&IR had 15 of these SW-9 units, numbered 11 through 25. General Motors at LaGrange Illinois built number 19 in 1953. Serial Number: 17878. She had a GM12V-567B prime mover, 1,200 hp. Sold to Union Railroad (Pittsburgh) in 1963, becoming their number 572. Port Townsend, today. 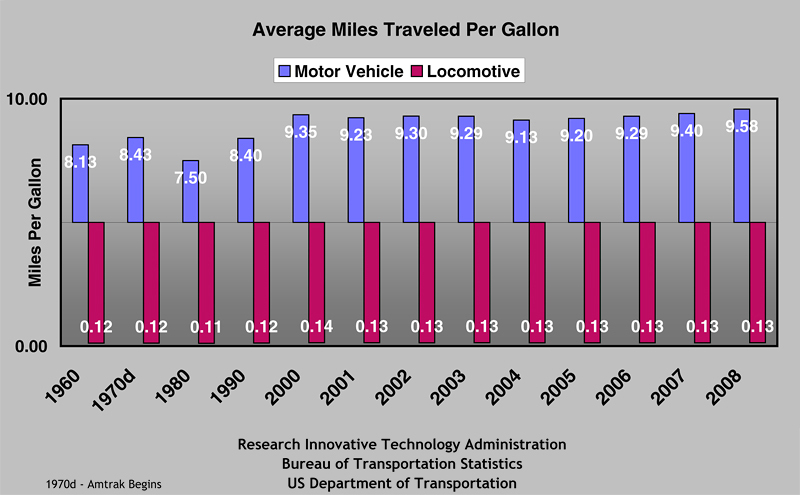 Once again, a flurry of activity on the 'net asking why automobiles don't get the fantastic mileage of today's "modern locomotive." Because folks are not listening carefully, the Norfolk Southern commercials sound like they are bragging about their freight trains averaging 400+ miles per gallon. Of course they are not. 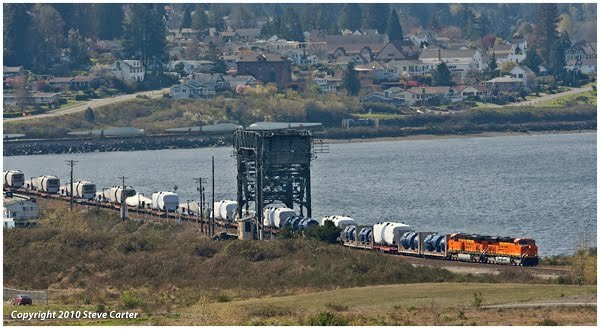 They are citing a common measurement used when comparing modes of transportation - motor truck, barge, train - the "ton-miles per gallon." I've said it before, and I'll say it again, locomotives simply are not rated in terms of "miles per gallon," no more than your skate board or Schwinn mountain bike. Once you can accept the fact that not everything on wheels has a corresponding "EPA rating," you will be free of conflict! But. 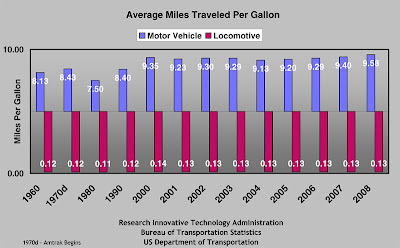 If you insist on applying some notion of "miles per gallon" for a locomotive, I have the pablum you crave; today's featured graphic! While researching "ton/miles per train/hour" for an upcoming article, I ran across a US Government site with the tabular information that I glued together to create the accompanying graphic. Somebody stashed away in the bowels of the US Department of Transportation managed to grind out the "miles per gallon" number you aficionados of mindless trivia love to collect. As you can clearly see, with all the fancy do-dads and integrated microchip wiz-bang computer technology high adhesion self-steering trucks and creep control that puts the "ka-ching!" in the cost of today's locomotive, they still average in the area of .13 miles per gallon, as compared to the family bus still averaging 9.58 miles per gallon! You will find this, and a lot more totally useful information at the Research & Innovative Technology Administration (RITA) web site. Port Townsend, today. 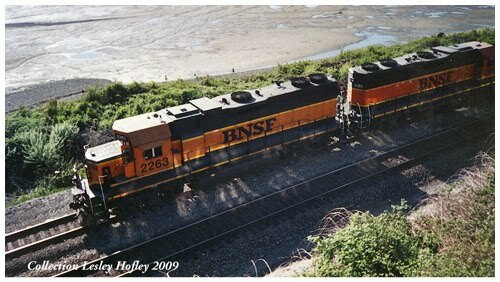 My sister lives over in Blaine, right on the Burlington Northern Santa-Fe main line into Canada. She is ever so grateful that I am not interested in photographs of GE "Toaster Ovens" or Jimmies "Made in Mexico." More than one conversation has been drowned out as south bound units ratchet up passing her place, having just cleared customs. One day she told me a work train had parked in front of her place. She was getting gassed out. She finally called the local constabulary, who called BNSF, who finally moved the units. She caught this maintenance of way equipment the other day. 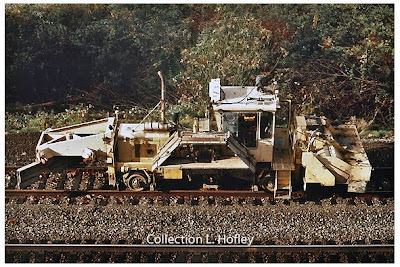 Sort of a cross between a miniature grader with a rotor till aft. Could this be a ballast regulator of some sort? Prince Rupert, September 1958. This is my memory of "maintenance of way equipment." These fellows seemed to be from Eastern Europe. Didn't speak English too well. But when I showed up with my camera, smiles broke the language barrier. At least for one of them! Port Townsend, today. 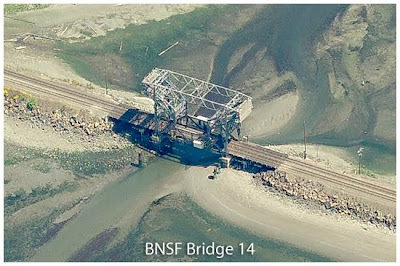 I recently received a comment to Bridge 14 De-Mystified. It didn't get published. I do not publish "anonymous" comments. 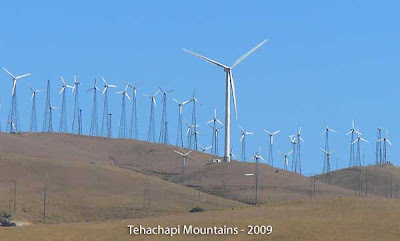 This blog represents who I am; accordingly, accuracy is important. 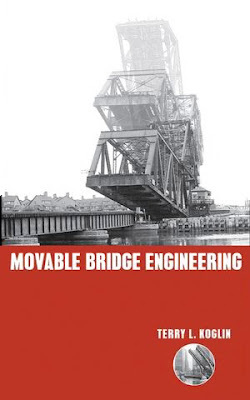 Terry L. Koglin, PE, has worked with several of the world's premier civil and construction engineering firms specializing in movable bridges. His work on hundreds of projects includes type studies, design, construction, rehabilitation, inspection, and evaluation of all types of movable bridges. So I placed a phone call to Mr. Koglin, to discuss the comment I had received. He returned my call today. I missed the opportunity to have a one on one with Mr. Koglin, which would have been very interesting, because I was out walking my pooch! We did make contact via email. I am correct in referring to Bridge 14 as a Strauss Vertical Lift bridge. 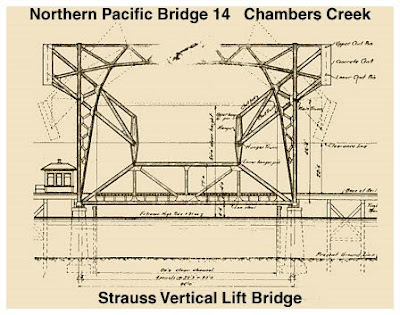 Strauss - the name of the designer; Vertical Lift - movement of the center span! 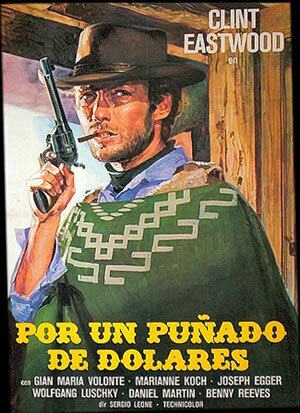 John Wiley & Sons, Publisher, Hoboken, New Jersey, Copyright 2003, ISBN 10: 0471419605. Today. Port Townsend. I have so many memories of railroading in Prince Rupert as a young man, they blur together. How fortunate I was to be able to experience the events going on around me between 1957 and 1959. One such memory was one of the Night Trick Operators, Don Vaale. 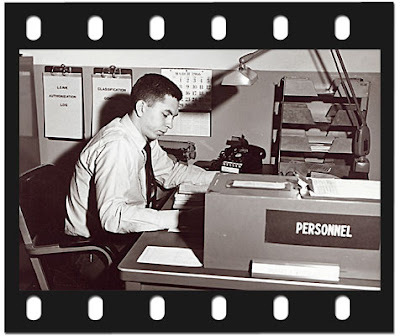 He had a Vibroplex speed-key that worked on a horizontal plane as opposed to vertical. Not for the novice, this was a finely tuned instrument, designed to send "dot's" and "dashes" of consistent length and spacing. Every night, when Don came on duty, he'd retrieve that key from it's green velvet lined travel case, and "fine tune" it for tonight's humidity, temperature and so-forth. The Vibroplex Bug has a series of screw adjustments and balance weights that need to be adjusted for sending dot's and dashes. Setting the key up was as time honored a ritual as setting the clocks. Don used a folded Form 19y instead of a feeler gauge to set the dash gap. It was such an interesting ritual, all conversation in the room stopped. Whom ever was in the room watched in rapt silence, as Don fiddled with this and that. I would lean on the Train Register Counter, and watch in awe and fascination, as he sent the "line up" card in Morse Code, up to Division. Years later, I came to have a REAL understanding of what he was doing. When I joined the United States Air Force, my entrance scores where such that I could request a career path of my choice. Seeing this as an opportunity to get my military obligation out of the way and further my life expectations, I requested the Armed Forces Radio & Television School (AFRTS,) at an Army base in Langley. And ended up at Ground Radio Operator school in Biloxi. So there I was in "Ditty-Bop School." Subjected to Morse Code class three hours a day, and voice communication transmissions, three hours a day. The instructor took great pleasure in explaining how exciting it was going to be, climbing into a tree in the jungle with a back pack radio, calling in air strikes! As I sat there reading weather forecasts to some imaginary pilot, or pounding out code on a common military key (not a Vibroplex,) I pondered slashing my wrists, drinking myself to death or running away to Canada. Mercifully, I flunked out of Ground Radio Operator school, liberating me from the oppressive humidity and horrid creeping critters of Biloxi. 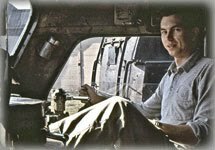 Once again, due to my high entry scores and "gung ho" determination, I ended up as a Personnel Specialist at Hamilton AFB, just north of "Baghdad By the Bay!" 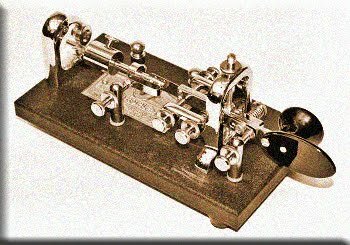 But every day, as I fiddled with that Morse Code Key, memories of Don Valle manipulating that magnificent Vibroplex Key came rushing back to me. I am ever so fortunate to have been able to watch a real, honest to god, railroad telegrapher exhibiting his skill! But there is another transportation issue I've been "in the closet on" for way too long. I feel the need to "come out." I really have issues with what I refer to as the "MMC" or Mickey Mouse Circle. The "eclectic" crowd up here in beautiful Port Townsend decided we needed to add some class to this already designated Victorian Seaport - one of only three such designated in the US - so we are hours away from inauguration of our first "MMC." While I was watching Judge Judy, it occurred to me, "damn! Now that the majority got their traffic circle, let's go all the way! 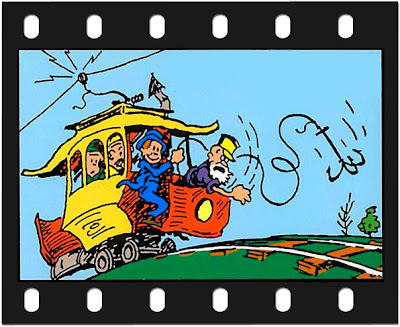 Let's go for a 'Toonerville Trolley!'" Then we could combine the best of both of the worst! 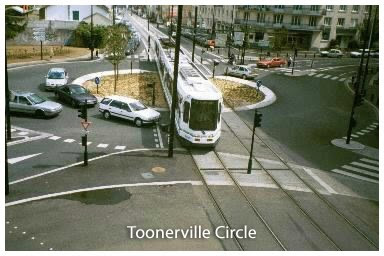 A "Toonerville Circle!" Port Townsend, today. There are several meanings to the phrase "loose ends." The one I'm referring to is the ubiquitous shoelaces. You know, the laces that untie at the most inconvenient time, like when you are carrying a box down a stairway. You may not know it, but there are 33 different ways of tying shoelaces. A fellow by the name of Ian Fieggen has worked this all out very scientifically. Ian states he does not appreciate being referred to as "someone who has too much time on his hands" to document, with such scientific precision, the various methods of tying one's shoes. So a tip o' my hat, Ian, I will honor your request, and not make such an uninspired remark about your absolutely fascinating site! Over time, Loose Ends begin to pester me. I've got to stop and secure them before I move on. 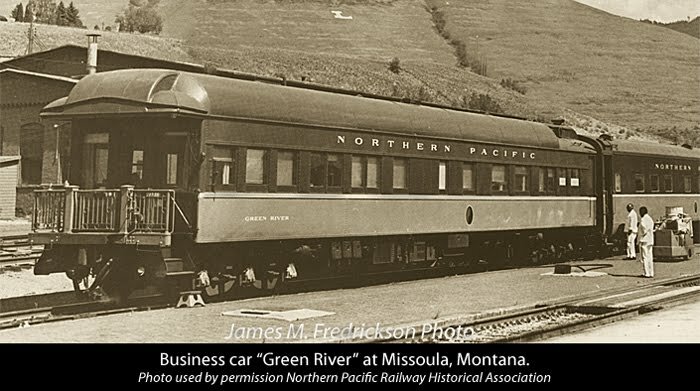 They include the story of BC Power Commission 84, missing an anniversary date concerning the Milwaukee Road, and the disposition of Northern Pacific business car "Green River." The picture I took of British Columbia Power Commission #84, in Burns Lake, BC back in 1959, has been begging for "closure." I've written about it before, most recently in February, seeking answers. Allen Hazen responded to me, and got me connected with the August 2009 edition of Railroad Model Craftsman. 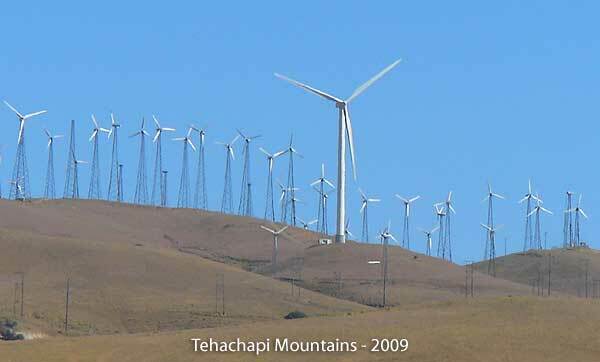 Low and behold, there on page 60, "Diesel power generating plants." The article concentrated on GM-EMD stationary and skid mounted generator plants, with but a single paragraph and photo connecting me to my past. From the article we did learn this car sold by the model number - M-16. 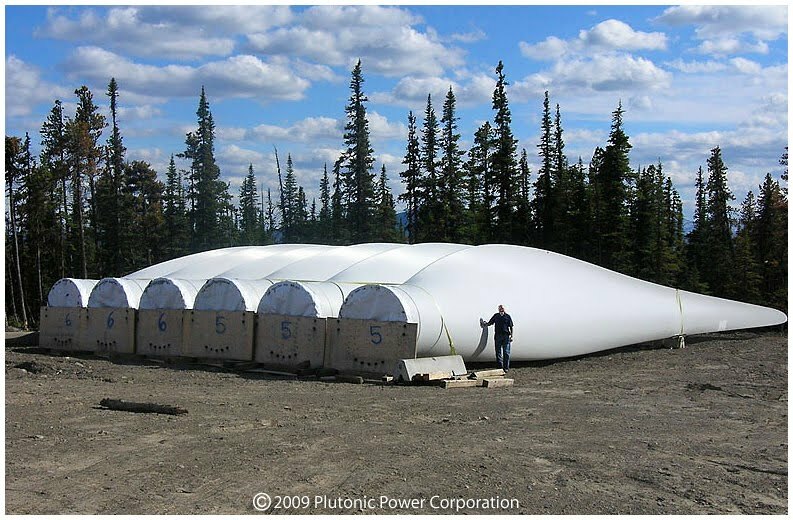 There is a photo of an identical unit, marked "Manitoba Hydro," hinting perhaps there were a lot more out there. That further piqued my interest. 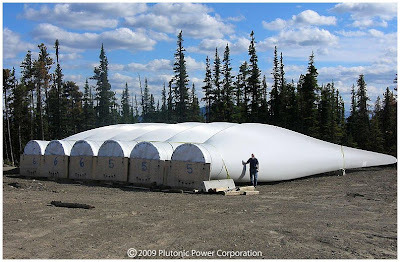 For example, did all Canadian provincial power authorities have these units? 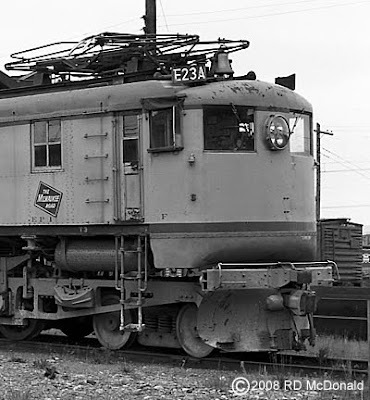 The EMD Model M-16, contained an off-the-shelf GM 16V-567C locomotive engine, along with switching gear required to interface with a municipal power system. 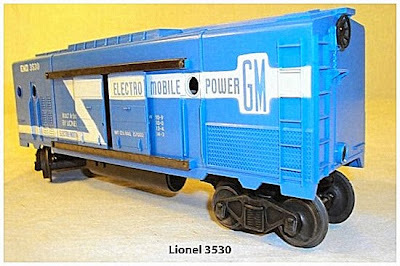 We also discovered that Lionel created a "power car" model 3530, based loosely - very loosely - on the M-16. As for "finding closure" on the topic, I recently discovered three former "BC Hydro" generator cars, minus fuel tanks and wheel sets, were recently sold by US Power & Environment. Seems I missed the 30th anniversary last month, of the last Milwaukee Road train to depart Tacoma. Perhaps because I've got so many irons in the fire that the date slipped by. Or, perhaps I am simply willing to let the Milwaukee Road glide quietly into history. Like Ed Gentry (Jon Voight in "Deliverance") said as he stood on a bank of the Cahulawassee River, in a liquor-induced moment of reflection, "Night has fallen. And there is nothing we can do about it." A few months ago, I did a piece on "The Crossing," the restaurant in Vancouver Washington where my late wife and I performed our nuptials. 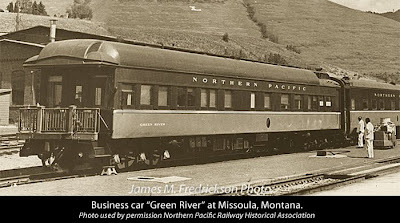 Only the necessary witnesses could fit into the cramped dining room of Northern Pacific Business Car "Green River." In seeking to learn more about this magnificent car with it's stunning mahogany woodwork, I was led to the Northern Pacific Railway Historical Association. They publish a glossy, professional organ, "The Mainstreeter." And there on the back cover of Volume 9, Number 4, the "Green River," shot by James M. Fredrickson, displayed here by special permission of the NPRHA. 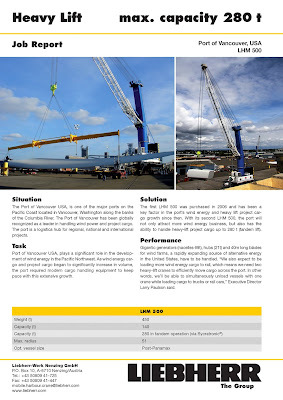 The entire 32-page publication, written by Lorenz P. Schrenk, is devoted to "Business Cars of the Northern Pacific" Parts 1 and 2. 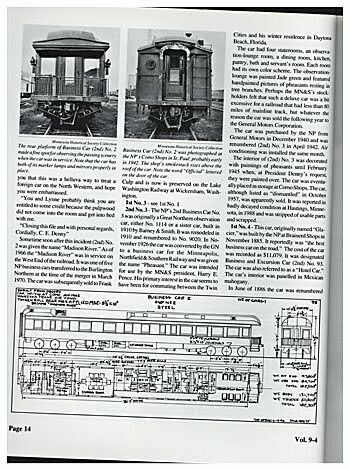 The publication is chock full of photos, and more important, floor plans, of the many Official Cars owned and operated by the movers and shakers of the Northern Pacific. 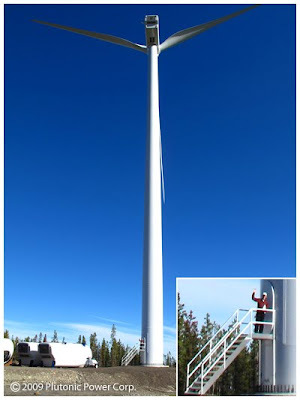 We thank Gary Tarbox for the opportunity to share this with you. 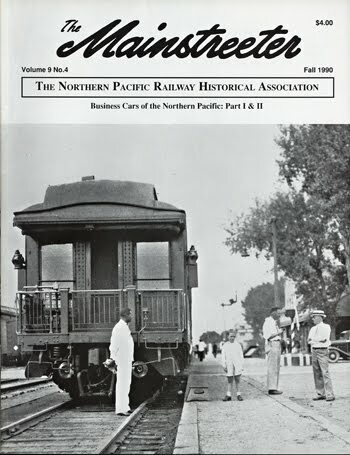 Here is your link to the Northern Pacific Railway Historical Association where back issues of "The Mainstreeter" are available. I did some inquiring as to where the car ended up after the restaurant was demolished. The car is alive and well, but I got the impression that the owners would prefer its location not be disclosed. I can appreciate that. Unfortunately, there are sub-species of rail fan who have no compulsion about taking more than photographs of rail equipment. Now I am going to see how many of Ian's 33 shoe lace patterns I can accomplish. Thank you Ian, for elevating the lowly shoelace to its proper place in society!